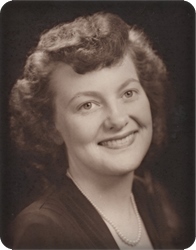 Virginia Mae (DeVries) VanderLaan, age 89, of Cutlerville, went to be with her Lord on Thursday, November 22, 2018. Virginia loved spending time with her family, was involved in Bible study, volunteered at church and school, and enjoyed cooking. A loving wife, mother, grandmother, and great grandmother, she will be deeply missed by her husband of 70 years, Sidney; her children, Larry (Shirley) VanderLaan, Mary Vanderlaan (Al Meyering), Ken (Deb) VanderLaan, Debra Vanderlaan, Renae (Eric) Gordon; 15 grandchildren; 23 great grandchildren; sister, Ruth (Tom) Zuidema; sister-in-law, Johanna Hulst-Borst, and Linda (Bill) Schaut. Her sister, Dorothy VanSolkema, preceded her in death. The family will greet visitors on Sunday, November 25, from 2 - 4 and 6 - 8 at Stroo Funeral Home, and on Monday, November 26, from 10 - 10:45 am at Trinity United Reformed Church, 7350 Kalamazoo Ave. SE, where the funeral service will begin at 11 am. Rev. Brian Vos will officiate. Interment will be in Blain Cemetery. Memorial contributions may be made to Faith Hospice. Hi Sid sorry for your loss our prays and thoughts our with you and your .